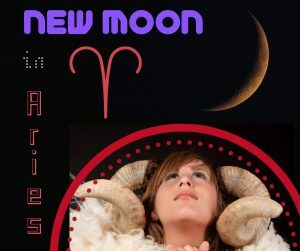 There will be a New Moon at 15°17’ of Aries, a Cardinal, Fire sign on the 5th of April. This New Moon is the last of seven Moons at 15° of their relative signs and it is also supercharged by being in the first sign of the traditional zodiac. This New Moon, as the first sign in the zodiac, symbolizes the starting point of a new journey, a rise to the next level. We need to leave our comfort zone and discover new pathways and destinations, We must endeavour to develop the courage that Mars demands, which is not the absence of fear, but the capacity to act despite of it by taking a leap of faith. Mars, dispositor of this lunation, is to be found in early Gemini giving a tendency to go off in too many directions. The Sun and Moon are approaching a square to Saturn in Capricorn which in turn is conjunct South Node and Pluto. Squares indicate tension or friction of some kind since the elements involved are not in accord with each other (in this case Fire and Earth). Saturn is the task master who demands his due for work badly done but rewards that well done, it’s also about responsibility and reasoning. South Node has a tendency to cling to the known and seemingly comfortable. Aries wants action and daring and it’s the sign where Saturn is in its fall and as such has little respect for the older and the wiser. Pluto is all about power, enforced or endured. What kind of juggling act do we need to perform in order to make these energies work together? I think that slow and steady could be a good motto for the coming month. New Moons are great times to set your intentions about new projects to undertake in the month to come so try to take some quiet time to think about what you would like or need to change in the matters of the house where the New Moon takes place in your chart. The New Moon falls on the 1-7th axis (Aries-Libra) in traditional astrology: the I vs us, me vs you, assertion vs compromise, independence vs relationship etc. Also affected by this New Moon are those people with planets or angles in the Cardinal signs of Aries, Cancer, Libra and Capricorn. Linda Goodman, author of the famous book “Sun Signs”, is said to have commented this New Moon “how appropriate that the archetypical Infant of Aries was protected by the seasoned and powerful Warrior of Mars”. The Sabian symbol for 16° Aries: “Nature spirits are seen at work in the light of sunset.” Indicating attunement to the potency of invisible forces of nature. For its antiscion at 15° Virgo: “A fine lace handkerchief, heirloom from valorous ancestors.” Indicating the quintessence of deeds well done. In which house does the New Moon fall in your chart? What intentions are you setting?